This is setup options for FTP upload send method (wsmFTP). They are located at Sending tab. 2. "Port" (.SendFTPPort) option specifies FTP port on file server. It's 21 by default. 3. 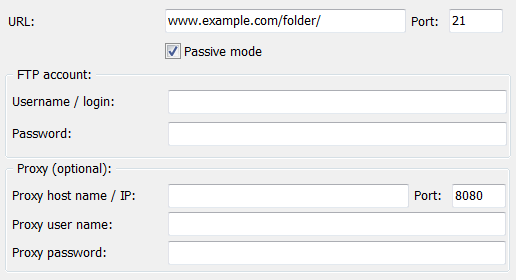 "Passive mode" (.SendFTPPassiveMode) option enables so-called "FTP passive mode", which is more friendly to client's firewall/NAT/network configuration than standard (active) mode. FTP can be run in active or passive mode, which determine how the data connection is established. In active mode, the client sends the server the IP address and port number on which the client will listen, and the server initiates the TCP connection. This is a default standard mode. However, in situations where the client is behind a firewall and unable to accept incoming TCP connections, passive mode may be used. In this mode the client sends a PASV command to the server and receives an IP address and port number in return. The client uses these to open the data connection to the server. It's recommended to enable passive mode to bypass client's NAT/firewall. 4. "FTP account" (.SendFTPLogin, .SendFTPPassword) options specify your account details on FTP server. Warning: your real account's data will be stored inside application. Even if it's encrypted - it's still stored inside .exe, so it can be stolen. Create a new special account for bug reporting via this method. Note: EurekaLog doesn't support SFTP protocol. 5. "Proxy" (.SendFTPProxyHost, .SendFTPProxyPort, .SendFTPProxyLogin, .SendFTPProxyPassword) options specify proxy details. You can leave them blank to use system-provided settings. Or you can fill these values to set custom proxy. • Differences between "SSL mode" and "TLS mode"